Ancient Egyptian history covers some 3,000 years, from the legendary King Menes (3100 BC), who united the Two Lands of Upper and Lower Egypt, to the conquest of Alexander the Great (332 BC). This period has been roughly divided into thirty dynasties, which have been grouped into three ‘Great Periods’, as shown opposite. Each of the three Great Periods bears a distinctive character. 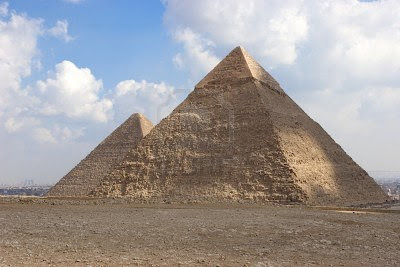 The Old Kingdom, the Pyramid Age, is considered by many historians as the high-water mark of achievement. A series of vigorous and able monarchs established a highly organised, centralised Egyptian government which saw a rising tide of productivity in all fields. It was a culture of great refinement, an aristocratic era, which ended in an explosion of feudal disorder, anarchy and bloodshed. The Middle Kingdom saw the country restored to national discipline by force of arms. The royal house was reestablished under strong leadership. Reorganizations throughout the Egyptian land was immediately reflected in an artistic and architectural revival, massive irrigation projects and a literary breakthrough. This period, when powerful monarchs ruled a feudal state, came to an end when the Hyksos, a warlike people who had settled in the Delta, successfully challenged Egyptian authority. Following the war of liberation Egypt emerged with a strong government and a regular army, heralding an era of international trade and foreign expansion. This was the New Kingdom, when Egypt controlled a vast empire and tributes and booty from the conquered nations and vassal states poured into the state capital at Thebes. It was a period of unparalleled grandeur, strength , wealth and prestige. In the Middle Kingdom of ancient Egypt, when the title ‘Repeating of Births' (ie renaissance) was adopted and the monarchs maintained their control over the feudal state by using many of the methods practised in the Old Kingdom, a harper sang: ‘I have heard the sayings of Imhotep and Hardedef with whose words we speak so often . . In the New Kingdom of ancient Egypt the upper classes criticised Amon (the god of the conquering heroes) as the usurper of the ‘true religion'. And when Ikhnaton, the world's first monotheist came to the throne he emphasised the connection between his new sun worship and the old sun cult at Heliopolis. In fact he built his sun temples on the same lines as the 5th dynasty temples at Abu Sir. And the symbol of his god, the Aten, was reminiscent of the description of the Sun-god in the 5th dynasty Pyramid Texts: ‘The arm of the sun beams'. After the Period of Decline in ancient Egypt, during the 26th dynasty revival known as the Saite Period, efforts were made to recapture ‘the time of the ancestors' .... for lo, their words abide in writing; open, that thou mayest read and imitate knowledge . . .’ And, indeed, the Saite rulers recopied the ancient texts and there is even evidence that they excavated a gallery beneath the Step Pyramid of the 3rd dynasty pharaoh Zoser to see how it was built. The ancient Egyptians believed that there was once a Golden Age, ‘The First Time’ when the principles of justice reigned over the land. What was actually meant by this oft-repeated phrase in ancient Egyptian texts is not known. It implies the beginning of an event and was often taken to mean ‘The Beginning’ or Creation. In fact the Egyptian priest Manetho, who wrote the history of ancient Egypt in Greco-Roman times, saw it as the pre-historic period which was filled with dynasties of gods and demi-gods. ‘The First Time’ might, however, simply be recapitulations which reflected the Egyptians’ pride in their own culture; a confirmation that order once existed. The Golden Age of ancient Egypt when ‘Maat (Justice) came from heaven and joined those who lived on earth’, may be the Old Kingdom civilisation, the purest period of Egypt’s ancient history, which rose to its peak and collapsed while Babylonia was still the scene of battles between city states fomented by petty local interests, and while Europe, America and most of western Asia were inhabited by Stone-Age hunters.